What could you cook up using the organic products from Glenisk? Well the organisers of the Blog Awards 2013 have partnered with the renowned Irish family business Glenisk to create a recipe competition which will be blogged all over the world. As well as sponsoring the Best Food/Drink blog category at this year’s Blog Awards Ireland, Glenisk has also partnered with the awards to give people in Laois the chance to enter a separate recipe competition. All you have to do is create your own recipe which must include a Glenisk ingredient. Your blog does not have to be a food blog to enter. 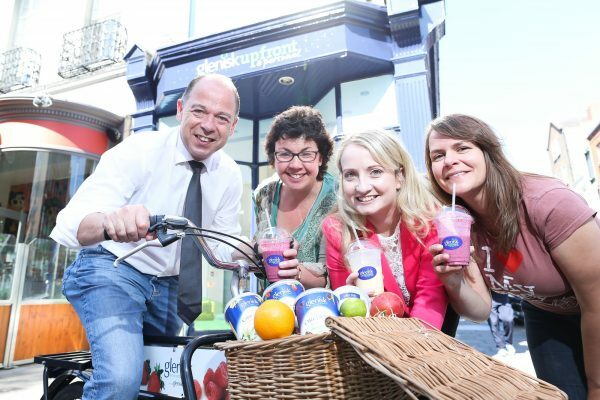 Why not check out some of the creative combinations Glenisk is currently serving in its Upfront & Personal Pop-up shop, located on the corner of Dawson Street in Dublin for some inspiration? Check out the full list of sweet and savoury options here http://www.glenisk.com/recipes/UpFront-and-Personal-Recipes/. A pre-awards event takes place in the Glenisk Pop-up shop on Thursday the 8th of August at 7.30pm. Your recipe must include the full list of ingredients, method and at least one image. You could have some fun creating and including a Vine video too if you like (optional). The closing date for the Glenisk competition is 4th September. All entries will be judged and the ten finalists will be announced on 29th September. All ten finalists will receive a free ticket to the awards and a prize on the night. The Blog Awards Ireland 2013 Recipe Winner will receive a fantastic overnight stay at Cloughjordan House and an opportunity to cook with Chef Sarah Baker at Cloughjordan House Cookery School. Second and third prizes winners will receive a €100 voucher for Kitchen Compliments. The other seven finalists will each receive €50 Kitchen Compliments vouchers. Blog Awards Ireland will bring together the Irish online community collaborating in a single event on 12th October 2013 to celebrate blogging in Ireland. The Blog Awards Ireland celebrates the best in Irish blogging by creating 32 categories, which offer plenty of scope for bloggers. The awards will take place in the Osprey Hotel in Naas, Co. Kildare on Saturday 12th October 2013. There will be a dinner and entertainment. The first 100 tickets will be available at the reduced price of €30, then they revert to the full cost of €50. Amanda Webb is the founder of Spiderworking.com working with SME’s to help them develop social media strategies, offering them training and support. She learnt her skills whilst promoting her first business, Feelgood Organic Hampers. Prior to this she worked as an Assistant Director in the Irish Film Business working on productions such as Adam & Paul, Angela’s Ashes and various commercials for brands such as Heineken, River rock & Guinness. In 2012 she founded Blog Awards Ireland along with her KLCK colleagues and heads up the online marketing and project management of the event. He blog reached the final of Social Media Examiners International top 10 Social Media Blogs of 2011 and 2012, The Social Media Awards 2012 and her Video Blog reached the finals of the Irish Web Awards 2010. Beatrice Whelan is an award winning digital communications, online PR and content marketing professional with a strong background in B2B marketing, search engine optimisation and social media. With 10+ years experience in multimedia development and digital marketing; she started blogging in 2004 and has been designing and optimising websites and blogs since 2006. Beatrice works at Sage Ireland as Social Media & Content Specialist where she manages the online reputation of this FTSE 100 company in Ireland. She is also editor of and contributor to the Sage Ireland blog and has guest blogged for the Huffington Post, Tweak Your Biz and the Digital Marketing Institute as well as contributing to Business Plus Magazine and other prominent publications. Lorna Sixsmith achieved finalist status for her own business blog Garrendenny Lane in the Irish Blog Awards and Social Media Awards (2011) in addition to achieving nominations in numerous business and marketing awards. Following the success with her business blog and usage of various social media tools, Lorna set up Write on Track in 2011, offering social media consultancy and training to SMEs who wish to develop and implement a successful social media strategy for their businesses. Lorna offers training in various social media platforms and can show business owners how they can drive more traffic to their website, increase brand awareness and most importantly, increase sales. Running her own online retail store means that Lorna is very knowledgeable regarding the challenges of achieving high rankings with organic searches within the search engines. She is able to analyse the effectiveness of a website and/or blog and show a business owner what needs to be altered in order to improve its rankings. Lorna works with County Enterprise Boards, Partnerships, SMEs and those at the planning stage of a business. Her blog at Write on Track (in collaboration with business partner Marie Ennis O’Connor) reached finalist stage in the ‘Best Blog of a Business’ category in the Social Media Awards 2012. Together with Amanda Webb of Spiderworking, they have set up We Teach Social, whereby they teach various social media courses online to participants all over the world. Lorna also blogs at Irish Farmerette and is currently writing a book entitled ‘Would You Marry A Farmer? Confessions of an Irish Farmerette which explores the role of women in agriculture with gritty realism and humour.